This conservation resource was created by Course:CONS200. Illegal logging in the Brazilian Amazon is a problem that deals not only with the environment, but also with various economic, social, and political pressures. Illegal logging that leads to deforestation is an issue that extends to local, national, and international levels. This page will describe the background of illegal logging in Brazil, its effect on the environment and economy, and the actors that affect it and are influenced by it. Deforestation, largely due to illegal logging and the unsustainable management practices associated with it, has been occurring in Brazil since 1970, with a large increase in the rate of deforestation from 1991 onward. The amount of deforestation due directly to illegal logging, and not due to urbanisation or legal and sustainable land clearing is hard to pinpoint, and has fluctuated since large scale losses began in the 70’s. In 2001, total deforestation in the Amazon reached more than 830,000 km2, 80% of this in Brazil . Annual rates peaked in 2004 at more than 27,000 km2 per year, before falling to 11,000km2 per year in 2007 . These activities occur mainly in the eastern and south-central region of brazil, forming a semi-circular “arc of deforestation”. These areas contain many pastures, plantations, and rural family farms which grow important food sustenance crops for local populations such as rice, beans, and corn. Cocoa crops are also prevalent in this area, and they are economically very important to many communities . Negative impacts of illegal logging and its associated deforestation are numerous. On a local scale, illegal operations are often unsafe and may take advantage of local people who have may have few other options to sustain their livelihoods. Local environmental impacts of illegal logging include soil degradation, forest fragmentation, increased risk of wildfire, and increased risk of damage to threatened or endangered populations through habitat loss . On a global scale, the Brazilian rainforest is a driver of continental precipitation patterns, as well as being rich with biodiversity and being a massive carbon sink.The reduction of biodiversity, and carbon storage by illegal logging is an international concern. Who and to what extent groups of people are affected, either positively or negatively, by illegal logging are determined by: government policy, economic conditions, and location. These actors, their actions, and the associated repercussions will be discussed below. Mahogany Swietenia macrophylla (mahogany) is the biggest export of wood from the Brazilian Amazon. Certain sources deem the wood products are exported out of the country as “other tropical species” even though mahogany has been prohibited from being collected and sold. It was even found that now that the product is in higher supply, buyers are purchasing more of it due to its more affordable price . The logging and purchase of mahogany caused a threat to its species; mahogany is now an endangered species and has been included in the Convention on International Trade in Endangered Species of Wild Fauna and Flora (CITES) . The CITES agreement is important as it directly addresses illegal trade of species. The removal of mahogany will cause habitat loss for other species and potential failure in any attempts to regenerate it in the Amazon . Although the exporting nation must prove that each account of timber trade is legal and has no negative impacts on any ecological components, employment of the policy has not been successful. Recently, only 3% of mahogany growing sites have been protected . It is imperative that more populations of mahogany trees are conserved for three reasons: to serves as a reassurance that the species survives despite the logging activities, to contribute to the gene pool, and to serve as references for management assessments . Virola The second largest wood export out of the Amazonia is Virola surinamensis (Virola). 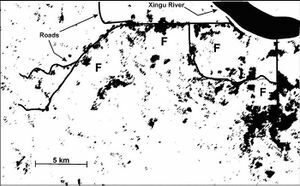 A study was conducted for environmental impacts from the unmanaged logging of Virola near the city São José do Rio Preto. The diminishing presence of the species resulted in substantially low levels of species richness and biodiversity in the areas surrounding Rio Preto. Logging practices have affected forest canopy in size and abundance, as well as the understory ecological community. Swamp forests in this area of Brazil began consisting mostly of vines and herbs, which is a dramatically dissimilar forest understory composition than usual . Extensive illegal logging practices exploit Indigenous land and result in tragically vast consequences on their communities. Mass extraction and logging processes require expansive interference to an area. This occurs through the creation of numerous roads that cut through communities and delicate habitats. Along with the roads arrives more modern-day colonization. In the Xikrin do Rio Catete Indigenous Area of Brazil, 130 km of roads had to be built for sole extraction of mahogany trees . One of the largest, isolated Native communities in the Amazon are the Yanomami people. Using identical livelihood methods for generations, the indigenous community continue to expend the forest’s resources for sustenance . However, with more recent industrialization moving into the region, the group is at risk. The numbers of extreme violence and crimes have increased through the exchanges associated with logging practices in the Brazilian Amazon . The logging practices caused noise pollution that influenced wildlife to retreat from the region, and influences diseases to emerge in the environment. The Brazilian government neglected to protect and acknowledge the Yanomami land rights . However, the government had recently promised to study the effects on the land for six months, with hope that soon it will be included in reserves . The state of indigenous land rights coincides with substantial biodiversity issues. Fortunately, certain connections between conservationists and indigenous groups succeeded in adding about 1 million km2 to indigenous lands . This occurred near the middle Xingu river valley, where the Kayapo indigenous community (7000 people) exists. A portion of their traditional land has been officialised by the government as reserves. Unfortunately, this does not protect their territories from industrial projects such as logging . What other costs and/or implications become apparent when illegal logging is viewed through the lens of other disciplines and professions? What special expertise, resources, or theoretical orientations might others bring to help us better understand the costs and/or implications associated with illegal logging in Brazil? Anthropologists and environmentalists are fighting for the ejection of commercial activity and the return of the Yanomami’s peoples lands back to the. 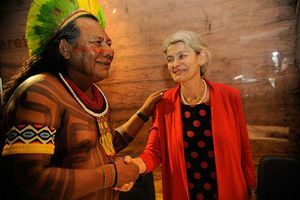 This is hoped to be achieved by meeting with Brazil’s president  Due to the distrustful interest for Amazonian resources, it is difficult to label the true supporters that fight for environmental restoration and indigenous rights. Fortunately, the presence of indigenous parties in government may have a powerful impact on confrontations with indigenous issues. Although, while Brazil’s constitution of 1988 officially recognized Indigenous land rights, its overall policy is to expand and colonize the Amazonian regions . Opposition In attempt to combat the issue, the Kayapo and representatives from 25 other First Nations communities met to oppose the government’s further plans of building dams and logging projects. The argument was that the groups supported development, however the projects needed to be reviewed so as to not overstep any human rights of surrounding communities . The use of technology has been a vital component in putting a stop to illegal logging. It allows the government and global organisations to have real-time feedback/visible changes and track illegal operations which are taking place within the forest. 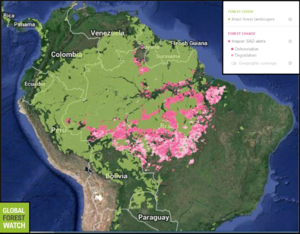 In 2007, the Brazilian government introduced DETER (Real Time System for Detection of Deforestation), a satellite-based monitoring system that could detect changes in the forest cover on a monthly basis. This allowed law enforcers to act quickly upon areas that are shown to have illegal deforestation activity and was the main reason why deforestation slowed down after 2007. It is estimated that the implementation of the DETER program was responsible for preventing the clearing of over 59,500km^2 of Amazon forest area from 2007 through 2011. Along with satellite monitoring, cameras, trackers and microphones have also been set up on the ground to survey the area. In September of 2015, the NGO Greenpeace provided the Ka’apor people of the Amazon with surveillance equipment totaling over $6300 USD. The natives were trained in the handling of the equipment and they were set up in the trees and along the roads. These cameras and microphones would pick up and record any changes in color and/or movement (e.g. license plates of trucks) then proceed to relay the information back to the computers at the base camp. The reason why technology is so essential to preventing illegal logging is its reliability and speed. It is almost impossible to obtain the same data and information the equipment provides with manpower alone. The moment signs of activity appear on the monitor, official/natives can respond take action immediately. The response time is minimal. Although the initial setup costs can be high, the utility that it brings is invaluable. When working with technology, government officials can quickly track down illegal activity and shut it down. Using the data from the national space agency INPE every month has allowed areas of new deforestation to be quickly identified through satellite monitoring programs .The closing of illegal sawmills and the jailing of the perpetrators, including government officials who have been bribed to ignore deforestation have dissuaded illegal loggers from continuing due to the increased pressure from government officials. The federal and state governments still hold large areas of public forests which are un-purposed. These areas are unmonitored and allow illegal logging to go on with almost no resistance. There were around 80 million hectares of these unprotected lands in but that number is gradually shrinking through the growth of indigenous reserves and protected areas. The collective tenure of these lands by indigenous people gives them the right to use the land for sustainable forest management and studies have shown that they have reduced the rate of emissions from deforestation by about ten times compared to the surrounding areas. The establishment of these areas for indigenous lands and conservation areas can have many positive benefits. During the week of 9th-16th of May 2016, the Brazillian Government announced the creation of five new protected areas in the State of Amazonas. These new areas expanded the existing protected areas by 2700 hectares. Brazil creates five new protected areas in the Amazon. Retrieved from http://www.wwf.org.br/informacoes/english/?52282%2FBrazil-creates-five-new-protected-areas-in-the-Amazon</ref> and aimed to protect biological diversity, develop recreational activities (ecotourism), support environmental stability. Vigilantes are groups of people who take matters into their own hands and defend the forests from illegal logging at the local level. Groups such as the “Guardians of the Forest’ use the forest as a sustainable resource by tapping and collecting the rubber from the trees. This method does not harm the trees ability grow and allows the local people to make a living off the rubber. On the other hand, illegal loggers cut down the trees for the profit from the lumber and only stumps are left behind. These vigilante groups try to stop the illegal logging by locating logging camps and destroying them or by ambushing trucks on their logging routes and threatening them not to return. Although these tactics can be extremely effective, it is also incredibly dangerous for those who are involved. There are often corpses of the defenders found, hidden around the forest, left by the loggers . In 2007, Norway’s Prime Minister Jens Stooltenberg announced Norway’s commitment to tropical foresion and promised up to $1 billion for Brazil’s Amazon Fund. The UNFCCC's “REDD+” (Reducing Emissions from Deforestation and Forest Degradation) system that was negotiated is one of the largest and most successful programs. The money received is based on a “results-based financing” system which means the money will only be received when the goal of reducing deforestation is met. The financial costs of REDD: evidence from Brazil and Indonesia. IUCN.). This gives Brazil a much-needed incentive to crack-down on illegal activities. The money they receive can then be used to purchase more utilities to combat deforestation. More information on REDD can be found at http://redd.unfccc.int/. Viewed through the lens of other disciplines and professions, what other actors become relevant when considering solutions to combat illegal logging? What special expertise, resources, or theoretical orientations might others bring to help us better resolve challenges associated with illegal logging? All the above methods have been used to combat the illegal logging of the Amazon and have proven to be successful. Deforestation rates peaked in 2004 at 27,423 square kilometers per year. By 2009, deforestation had been fallen to around 7000 square kilometers per year, according to Brazil’s National Institute for Space Research (INPE) . But a key factor that has been slowing down improvements is the presence of corruption among government officials in Brazil. Loggers are able to bribe their way into false contracts and permits or convince government officials to look the other way. Sometimes data can also be misleading as they have been altered or deleted. It is difficult to measure how much corruption is really taking place as it can often go on unnoticed by external parties. It is impossible to stop illegal logging by only looking at the forest itself; Corruption problems within the country must also be tackled at the same time if changes are wished to be seen. This Wiki Page has demonstrated the extensive de-forestation that has taken place within the Brazilian Amazon Rainforest. As Brazil's illegal logging posses a tremendous threat to the well-being of the bio-diversity rich tropical rainforest of the Amazonia, it also directly creates a tremendous hazard to the peoples of Brazil. Environmentally, the historically abundant rainforest has proved to be an extremely large carbon sink, simply due to its incredible volume, and surface area. In areas with observed de-forestation due to illegal logging, carbon sink potential, and bio-diversity levels have decreased exponentially. As it has become known environmental degradation is great from illegal logging, moreover, illegal logging drastically effects humans, as the Amazon rainforest proves to be the home of a plethora of Indigenous tribes ancestral land, these lands are being effectively destroyed through illegal logging. This illegal logging proves to be an industry valued in the millions [of dollars$], in which the trade of an illegally sourced commodity deserves action through domestic policy. This becomes a tremendous policy issue, which is deserving of ample attention, however, the nature of illegal logging within Brazil is tied into governmental corruption, therefor, any intergovernmental action will prove to extremely inefficient. The preferred, and potentially most efficient alternative option is continued intervention from international corporations, such as REDD. This governmental alliance with REDD has had positive outcomes, and with continued work with REDD, improvements will continue. It becomes very difficult for intervention from within the Brazilian Government, due to the corruption that is present within the current Government, therefor an international body will prove to be a decisive factor in implementing change. ↑ Olsen, N., & Bishop, J. (2009). The financial costs of REDD: evidence from Brazil and Indonesia. IUCN.